Looking for the perfect pizzelle maker for your kitchen? In today's post, we review the top 5 models on the market right now. Find out what we think of them and why. Pizzelle are one of the most delicious cookies around, and making them is really simple. The light batter consists of only flour, butter, baking powder, eggs, sugar, and vanilla. Today, cooking pizzelle has never been easier. Modern pizzelle cookie makers make the whole process a piece of cake (pun intended). In today's guide, we recommend the 5 best pizzelle cookie makers on the market right now. 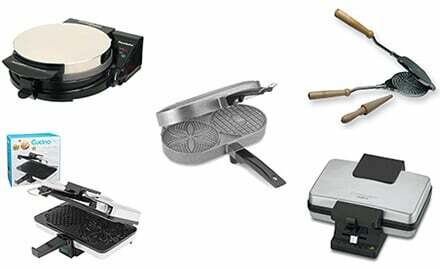 We've covered the best traditional pizzelle iron, as well as the top modern devices. Each of our recommendations comes with awesome customer feedback on sites like Amazon, and we are pretty satisfied that we've chosen the best models available. Take a look at the comparison table to compare the important features of the top pizzelle machines. Just click on the image to see the latest price. We review each model in more detail following the table. 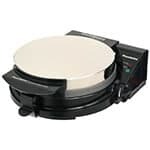 This Cuisinart pizzelle maker ensures that making pizzelle has never been easier. Even the cleaning process is simple and stress-free due to the non-stick Teflon plates. This pizzelle press is designed to cook two 4 inch cookies at the same time. It features 5 baking levels (or levels of browning). Simply choose the browning level and wait for the dual light indicator to inform you when your pizzelle are ready. The cookies can be ready in as quick as 60 seconds. Just wait for that green light. This pizzelle press doesn't suffer from uneven cooking (like many do) either. It features a locking lid that ensures both pizzelle are evenly browned. One of the trickiest parts of making pizzelle is removing them from the iron when they are finished. With these Cuisinart non-stick plates, there is no need to worry. They are easily removed while still warm, so they can be rolled up into cones. As anyone who has used Teflon coated pans can confirm, cleaning this type of surface is really easy. A damp cloth and a quick wipe should be all that is needed. The device comes with a measuring spoon and a wooden rolling dowel for making cannoli. It also comes with an amazing three-year warranty to ease any anxious minds. Bottom Line: Making pizzelle has never been easier than with the Cuisinart WM-PZ2. Even cooking and 5 levels of browning mean the perfect cookie is guaranteed every time. It's one of the best pizzelle presses available. This is the highest rated pizzelle baker on Amazon. It also makes some of the biggest cookies at 5 inches. The CucinaPro isn't as flashy as the previously mentioned Cuisinart WM-PZ2, and doesn't have all of the flashy automatic cooking features and multiple settings. However, it is significantly cheaper and cooks some amazing pizzelle. You just have to work a bit harder to make them and get the timing right. 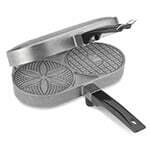 This model comes in a choice of non-stick Teflon coated plates or aluminum plates. There's actually no difference in price between the two, so it's completely up to you. Pizzelle are naturally full of quite a lot of butter, so the Teflon plates aren't a necessity as the cookies don't tend to stick anyway. An important safety feature of this model is the steam guard that protects your hands when opening and closing the iron. The iron uses extra thick plates that create a lot of heat. This makes sure the pizzelle cook quickly, but more importantly, evenly too. Bottom Line: For the money, this is an amazing buy. It's easy to look after and makes perfect pizzelle. The Palmer Classic looks traditional in style but actually uses 120 Volts electricity by plugging into the mains supply. It uses the traditional style metal plates, but applies the heat to both sides of the pizzelle, to cook it quickly and evenly. This model is comparable to the CucinaPro that we previously mentioned, but the Palmer is a bit more expensive on account of the high quality, thick aluminum plates it uses. The Palmer Classic is made in the USA and comes with an amazing 5-year warranty. It doesn't have the automatic settings that the Cuisinart model has, but it won't take you long to get used to the timings for perfect pizzelle. It's well built and reliable and can make thin and crispy cookies every time. Bottom Line: This one is for the purists. A classic cast aluminum design with a modern touch. The Chef's Choice 835 is the cheapest model we have included in our recommendations of the best pizzelle makers. However, that doesn't mean it's in any way insignificant to the rest. It is actually capable of making 3 pizzelle at the same time and can finish the job in just 45 seconds. Like the Cuisinart WM-PZ2, it has a light system that indicates when the pizzelle are ready. The lights tell when the unit is heating up and when it is ready to cook. It even has a dial that allows you to select how well cooked the pizzelle should be. It also features a similar lock system to the Cuisinart model, that ensures that the lid is always tightly shut. This means the pizzelle always get the maximum amount of heat and that they are evenly cooked. The Chef's Choice 835 actually has a unique temperature recovery system too. This ensures that the device is always ready to cook, and will reach the optimum cooking temperature in just seconds. The 835 uses Teflon non-stick plates that make it really easy to clean. In fact, there's also an overflow channel so you can easily collect any excess batter. The one year warranty isn't as impressive as the more expensive models, but this model costs about half the price. Bottom Line: This is a great value buy. 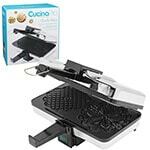 It's the cheapest of our pizzelle iron reviews. It's capable of cooking loads of pizzelle in a short time. Perfect for parties! This is the only non-electric pizzelle iron in our list. It's a traditional Italian stovetop pizzelle iron, for those that want to make pizzelle cookies in the way they were intended. It's made of high-quality aluminum that is particularly good at conducting heat. This material gets super hot in no time and makes amazing, evenly cooked pizzelle. The handle is made of heat-resistant wood and is extra long so you can stay at a good distance from the heat source. This has no flashy automatic features but makes quality pizzelle just like the others. However, the quality is reliant on the timing and skill of the chef. This model definitely gives more of a sense of satisfaction to the chef, as cooking with it is not just simply a matter of pressing a button and waiting. Bottom Line: It's not flashy like some of the others, but it uses the simple design that some of the tastiest pizzelle in Italy are made with. This is for those that just love to cook. It's probably the best pizzelle iron available. Pizzelle cookie makers are relatively simple contraptions, but there are a few big differences between the top models. We've listed the key things you should be looking at when getting one for your kitchen. Look out for these key points in our pizzelle maker reviews. Using even the most complicated of pizzelle machines is not exactly rocket science, but some models do offer features that make cooking with them a little easier. 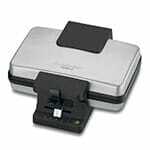 Our recommended model is the Cuisinart WM-PZ2. What makes this special is the automation that it offers. You can select how well cooked you want the pizzelle to be, and it also has a light system that shows when they are ready. Compare this with one of the traditional models like the SCI Scandicraft Stovetop Iron. 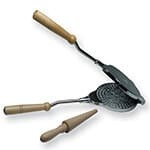 This is just a basic iron with a wooden handle, just like the original pizzelle irons. This makes pizzelle that are just as good, but you are required to monitor when they are ready. There are no automatic features, it's down to the skills and timing of the chef. This type of model gives the user more joy to use and is definitely one for those that love to cook. The different models make pizzelle of varying sizes and numbers. Some make 3 or 4 pizzelle at once, but they might only be small. Others might make huge cookies, but only one at a time. Pay close attention to the numbers, so you don't leave someone in your family waiting too long for second helpings. 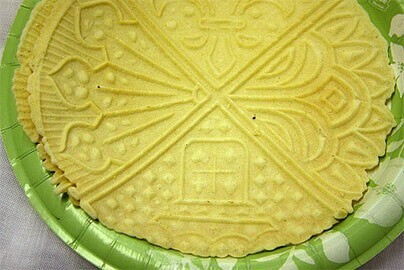 Pizzelle cookie makers generally come in a choice of two materials. There's the non-stick Teflon coated option and the more traditional aluminum option. The teflon coated material is very easy to clean, and it also makes removing cooked pizzelle very simple too. There's no need for any extra oil to be applied. The aluminum material tends to get a bit hotter and therefore cooks faster. However, it might require some extra oil so that the pizzelle don't stick. Pizzelle generally have quite a lot of butter in them anyway, so sticking isn't too much of a problem. This option is harder to clean than the teflon coating. There are two types of cooking method available. There's the modern electrical type, much like a sandwich toaster or electric grill. Then there's the more traditional stovetop iron. Each has their pros and cons. Electrical - This type of maker is easier to use and commonly has lots of automatic features. You may be able to select how well cooked you want the cookies, and it will warn you when they are ready. They are usually bigger and can make multiple pizzelle at the same time too. Stovetop pizzelle iron - This type of maker requires more skill to use. Making pizzelle is not exactly difficult, but using a stovetop iron means you have to turn it and also judge the timing just right. The big positive with this method id that it is completely portable. You can use it on the BBQ and even take it on camping trips. It isn't limited to an electrical power supply like the others. So the main question is: portability or convenience? They obviously make the perfect pizzelle, but they aren't just limited to that. They also make great waffle cones and bowls. Many of these devices come with a waffle cone roller, so making them is easy. They are also capable of making stroopwafel. These are a bit harder to make, but they're definitely worth mastering! Stroopwafel are much like pizzelle, but they contain a caramel filling and are often flavored with cinnamon. You shouldn't just limit yourself to well known recipes though. Experiment, experiment, experiment! Some of my favorite snacks were formed as a result of my tinkering in the kitchen. "There are no lentils left? Oh well, let's try this!" Pizzelle are traditional Italian waffle/cookies that can be thick or thin, hard or soft, or crispy or chewy. They are made from just a few simple ingredients that are present in most homes. Pizzelle are thought to have originated in Ortano, which is a region in Abruzzo, in southern Italy. The Italian word for "round" and "flat" is "pizze". This is also where the word "pizza" originates. They are called ferratelle in the Lazio area of Italy, and in Molise they are called cancelle and ferratelle too. Other countries have developed a pizzelle like cookie too. The Norwegian Krumkake is very similar and is thought to be one of the oldest cookie type recipes around. They are usually beautifully decorated with snowflake patterns. These decorations are made by the iron which molds the cookie. 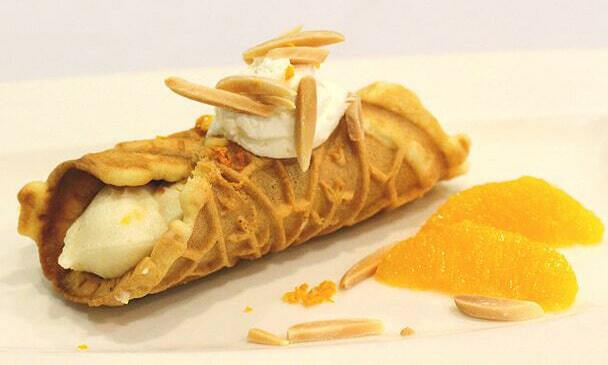 Pizzelle are commonly rolled into cones or shaped into cannolo when still warm. They are then filled with delicious ice-cream, crème, fruit or chocolate. The cones or shells are shaped with a wooden tool called a dowel. These wooden dowels are supplied with some models. We thought we'd share our favorite pizzelle recipe. It's really simple and tastes great. It makes 20-50 pizzelle. Why not keep some mix frozen for when you're feeling lazy? Mix the sugar, salt, vanilla, and eggs thoroughly. Gradually add baking powder and flour, and keep mixing until it's smooth. Slowly add the melted butter. Add the batter to the preheated pizzelle iron. We told you it was easy! For more kitchen ideas, don't miss our guide to space saving utensils or our reviews of the top mini-freezers. Follow us on Facebook to stay up to date with all the latest article releases. There's a link on the right. We post daily on all things tiny house, cooking, and the environment.